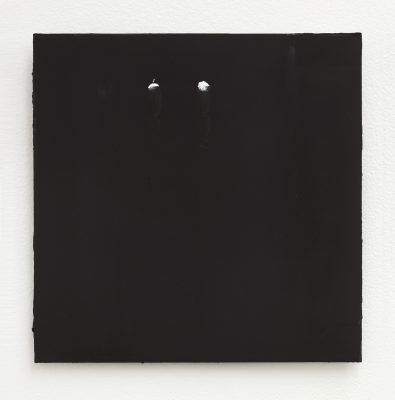 A K Dolven (born 1953) is a Norwegian artist whose fifth solo exhibition at Galerie Anhava is on view. 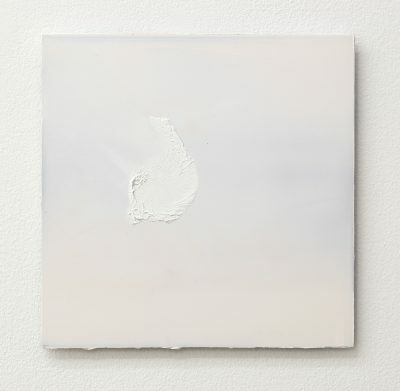 She has studied in Norway and France, and always moved between different media and scale in her practice. 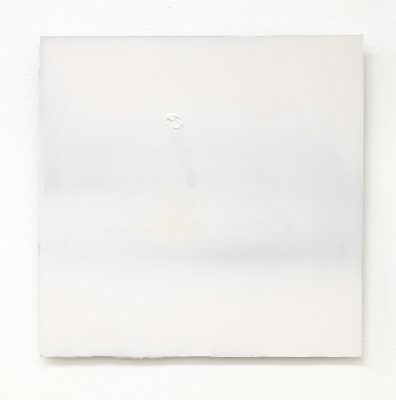 Her paintings are, in practical terms, always highly physical, in a direct relationship with the artist’s own body and its movements. Her photographs and videos are directed and recorded performances. Her sculptures range between large scale outdoor works and intimate objects. A K Dolven, born in Norway, has her home in the Lofoten Islands, but lived and worked for over thirty years in metropolises, Berlin and London. This is reflected in her works. On the one hand, they are marked by a close, natural and unforced relationship with nature, respect for it, and the warmth and respect for other people that are typical of inhabitants of sparsely settled areas. On the other hand, they may contain the density of urban life, the coolness of people living together with millions of their own species, and even their indifference to strange occurrences and phenomena. In any case, human beings are at the core of everything. The exhibition to you 1994–2018at Galerie Anhava features three sets of works which are linked in various ways to each other. 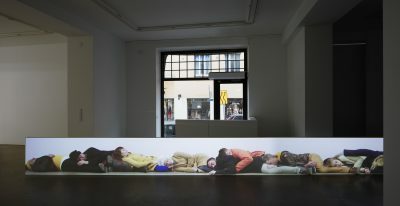 A Other Teenager (the title not a typo but a mismatching detail of the kind that is also typical of Dolven’s works, something that makes us stop) is a fifteen-metre long video installation in which people of almost natural size are lying on the floor entwined with each other. They are listening to music composed by Stian Westerhus, inspired by the composer’s conversations with Dolven about the times in which we are living. Slowly and almost imperceptibly, a young woman crawls over and under this human chain and disappears into the right margin of the image. Of the people in the chain, only one – a teenage girl in the middle of the field of view – looks at us, the viewers. 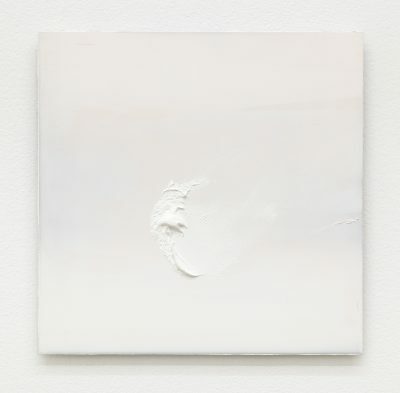 The second exhibit consists of paintings in which Dolven has applied light touches using her finger dipped in oil paint, as in the work touching you with snow on my fingertips. In the work hitting the sky with snow on my shoulder, the artist has pressed her shoulder covered with paint against the work. The third part features a video in which a twelve-year-old girl is exercising on a round, white slab of marble, placed by the coast in a field for cows. She is completely focused on herself, not performing but following her own will, enjoying herself. The marble slab is a sculpture by A K Dolven in Sandnes, near Stavanger and the 16 mm film transferred to video is from 1994. In 2018, Dolven returned to Stavanger and found her sculpture to you, which had become overgrown with moss over the years so as to become almost unrecognisable. 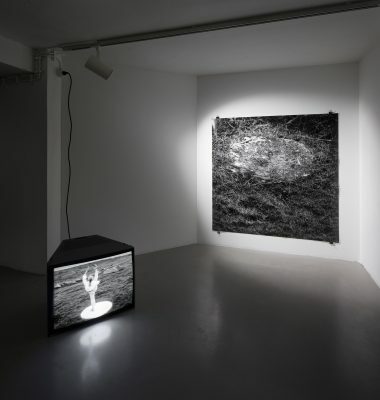 She photographed the piece in its present state, and this photograph of the Thassos marble in real size is displayed in the same space as the video on a monitor on the floor. The girl appearing in the video is the young woman in A Other Teenager, 21 years earlier. Characteristic of Dolven’s videos and photographs are references to earlier art-historical styles or individual existing works. In these works we can identify at least references to surrealism, minimalism and earth art. Or perhaps we should speak of tangentiality rather than references. 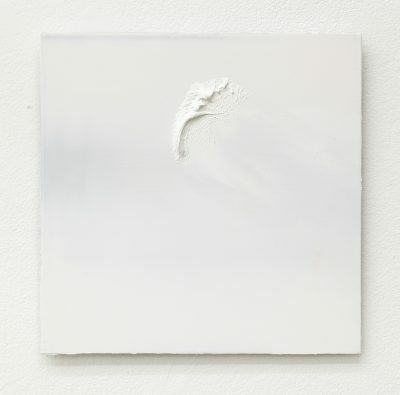 In Dolven’s works, the expansive air of the Lofotens, lightness, the togetherness of people with each other, the joy and opportunity for insight also provided by solitude, the passing of time, the ageing of stone and people create a large cycle in which all things are related to each other. A K Dolven has displayed her works in many leading art institutions and galleries, including Kunsthalle Bern, The Philadephia Museum of Art, Hamburger Bahnhof in Berlin, the Ikon Gallery in Birmingham, Platform China in Beijing, The National Museum of Art in Oslo, The Kiasma Museum of Contemporary Art in Helsinki, and The Louisiana Museum of Modern Art in Humlebæk, Denmark. Her works are included in the following collections, among others: The Art Institute of Chicago, The Louisiana Museum of Modern Art and The Hoffmann Collection, Sammlung Goetz. A Other Teenager is supported by Arts Council Norway.